In order to be able to document some new measurements on springs from a new customer, we have invested in additional measurement equipment. Thanks to this, we can now document special endings on springs. An improvement that all our customers can benefit from. This way we stay in forefront also in this area. We have also invested in an additional grinding machine, due to the increasing demand for grinded springs. Lesjöfors has acquired the German spring manufacturer Stumpp+Schüle GmbH which manufacture springs and flat strip component. The company is based in Beuren near Stuttgart. The acquisition strengthens Lesjöfors’ position in Germany, which is by far the largest spring market in Europe. Lesjöfors will be one of the largest suppliers of springs in Germany with sales of about SEK 500 M. Lesjöfors already conducts manufacturing operations in the Ruhr area, and this acquisition will also establish the company in the heavily industrialized region around Stuttgart. This is a key strategic acquisition. We strive for strong market positions in selected markets. Germany is Europe’s largest spring market and this acquisition enables us to strengthen our position there. We have the pleasure to introduce you to our new Application Engineer, Søren Vedel, who started at Lesjofors Tinglev in January 2012. 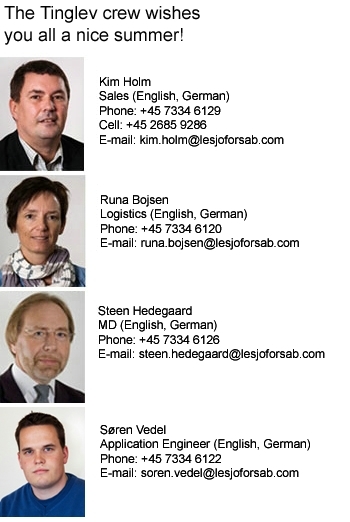 Lesjöfors has production or sales offices in nine countries: Denmark, Sweden, Norway, Finland, Germany, Great Britain, Holland, Latvia, Korea and China.